An alligator watches us from among the lily pads in the Okefenokee Swamp. 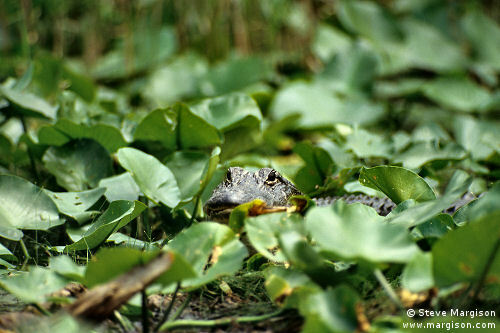 The head of another alligator is barely visible as it lies hidden under the lily pads at the bottom of the picture. Last updated or revised on February 5, 2013. Contents of this page copyright © Steve Margison 1999 – 2019. All rights reserved.